Barbunya is a very common and popular olive oil dish (which is cooked always/only with olive oil and served cold) in Turkey. Delicious fresh barbunya beans appear in farmer's markets in midsummer. What people usually do is to buy large amounts of barbunyas, pod them, and then keep them in the freezer for the winter. Fresh barbunyas are always preferred to dried ones. However, since it's impossible to find fresh barbunyas here in the States, I learned to love dried barbunyas. After years of uncertainty and confusion I am finally positive that barbunyas are roman / red beans. 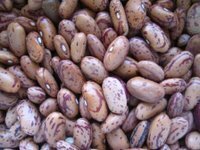 If you cannot find barbunya (roman) beans, you can try the same recipe with pinto beans, which look exactly like barbunyas. 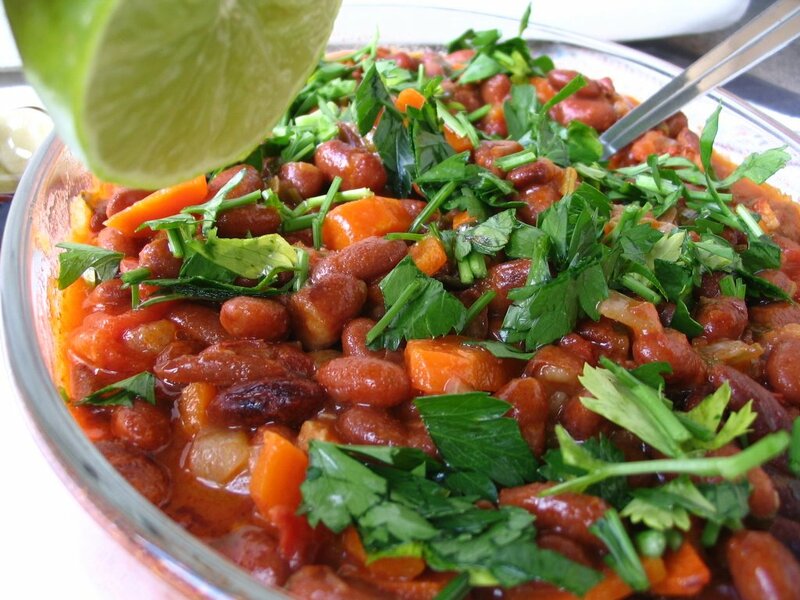 Pintos taste different than barbunyas, but still may surprise you with this recipe. 1/2 bunch parsley, leaves coarsely chopped. -Add the carrots and cook until carrots get kind of soft. -Add the tomatoes and cook until they turn darker red (basically until they're cooked). You can try it warm, but Barbunya like all Turkish olive oil dishes is served and best when it's cold. Squeeze lemon juice on barbunyas before you eat. PS: Most people use potato (one, peeled and diced added with carrots) when they cook barbunyas, but I prefer not to. Yummy....this is my favorite dish ever! I love this in the summer where I can buy them fresh from the farm. Your recipe is exactly like mine. I tried this with olive oil and vegetable oil and it comes out the best with olive oil. I just read a recipe that called for Roman beans, so now I know what they were talking about. As I love beans, this looks marvelous. Thank you! Krista, where do you buy them fresh? Which farm? I'd love to find fresh barbunyas here. 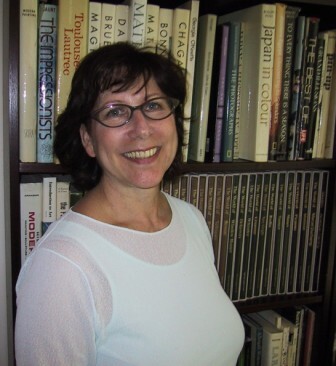 Sher, I agree with Krista; barbunyas are great. If you love beans (I absolutely do), I'm sure you'll like barbunyas. what about borlotti beans? Are they the same as roman beans, they look exactly like the ones on the pic! The recipe makes me hungry! I love beans in cold salad. Your salad does look very attractive. In the area I live, it's hard (impossible) to see any fresh beans or peas, in season or not... don't know where they go?! I find them in the summer time at a farm they grow them there. They usually come out in August. In Boston they also have a hay market every weekend they have them there also. I can't find them in the winter but my sister sometimes finds them at the market. Thanks Gattina! I'll do join as soon as I'm done reading papers and grading. Beautiful photos and delicious ingredients - who could ask for more. Thanks for sharing. I love your entry. I haven't heard of this type of bean before, or the idea of a dish with beans, olive oil, tomatoes, and herbs served cold either. I think it would taste great. To me learning new things ike this is what Weekend Herb Blogging is all about, so thanks for sharing this. I buy barbunya (or roman or red or borlotti)beans from a co-op here in Bloomington. I've never seen them in a pack, but it's easy to buy them in bulk. I don't have barbunyas, but I have pintos. I guess the pintos will have to do until I can find some roman beans. it's no hurry, please take your time. I'd love to see your meme (later). Thank you! Coffeepot barbunya beans are exactly what you have. Barbunya means pinto beans in Turkish language. "Barbunya" is a Turkish term. 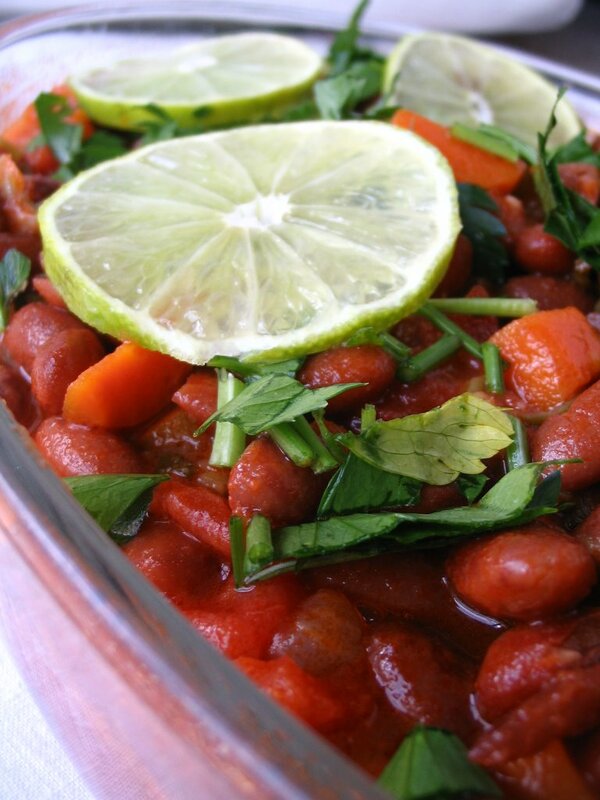 Dilek is right, barbunya beans are borlotti /roman beans in English. And although barbunya looks like pinto, they taste completely different. Great recipe - I've spent half a day looking for roman/borlotti/cranberry/shelly beans, albeit with no success. I've cooked with dried pinto beans quite a bit in the past and there is a big difference IMHO...I did find a producer (Barry Farms on Amazon.com of all places) that apparently has cranberry beans - so I may give that a shot. Thanks again for the great recipe and the mouth watering photos. If your area happens to have a large Hispanic population, try those markets. I've seen large bags of roman beans by Goya. Oh man, I'm like looking for "Borlotti" beans everywhere just to make this, one of my favorites, and finally! Yay for Roman beans, yay for this blog! I happened to find this recipe on a google search to use the dried Roman beans I found at the store. It is delicious!! Thank you so much for posting.. can't wait to explore the rest of your site. I think they are cranberry beans, you can find them for a few weeks a year in San Francisco and Los Angeles. You can find fresh frozen cranberry beans at Walmart! Hi, just wanted to add that you can also add diced potatoes to this recipe. It brings slight starchiness to the dish, and most barbunya pilakis I ate had potatoes, so it is not an unusual addition. 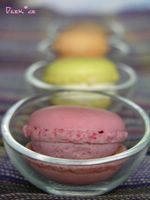 I enjoy reading through your receipe post, I wanted to write a little comment to support you and wish you a good continuation All the best for all your blogging efforts. Appreciate the recommendation! Let me try it out. Keep working ,great job! Thanks for sharing this amazing recipe! Thank you! It is word for word my recipe and the writer claims it a creation of his/her. Unbelievable! Kolay gelsin, Berfu ve tesekkurler guzel sozlerin icin. Siten acilinca linkini gonderirsen ben de eklerim. yine de link i bu. Eğer çok benzeyen birşey görürsen çekinmeden söyleyebilirsin ben de değiştirmeye çalışırım. I bought fresh roman beans at an international store on clearance and had to come home to internet search to figure out what they are and for a recipe. Wonderful recipe. These beans are great. The flavor is so different than any bean I have ever tasted. Great, great, great. Thank you.